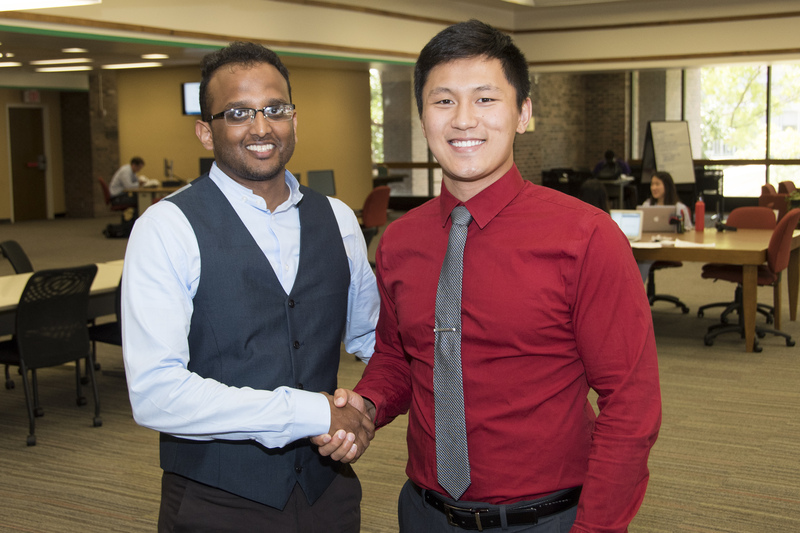 Amit J. Patel, M.D.’05, congratulates sixth-year medical student Luke He, the first recipient of a scholarship Patel financed to recognize students committed to helping others through volunteering. But now He has been recognized for that work, and in a big way, as the first recipient of the Amit J. Patel Extra Mile Scholarship. For He, service to others has always been a top value in his family. He has lived that by volunteering with Big Brothers Big Sisters, the Gold Key International Honour Society, Camp Cardiac and Harvesters. He is co-president of the School of Medicine’s Class of 2019 and previously received a Missouri State Medical Association Scholarship, which has helped him get on his way to a great career. And he said the Extra Mile Scholarship will be a great help, too. He also plans to keep up his volunteer work with Big Brothers Big Sisters.